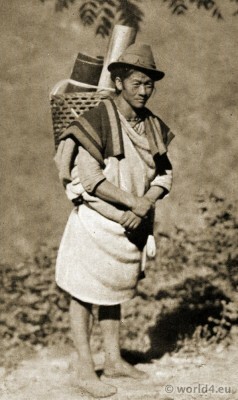 Traditional Lepcha Man costume c. 1910. Home » Traditional Lepcha Man costume c. 1910. The Lepcha are a tibet Burmese mountain farmer-folk, which is located in the region of the eastern Himalayas, Sikkim, Kalimpong and Darjeeling, as well as in Bhutan and as a small minority in Nepal for hundreds of years. Although they are the original inhabitants of Sikkim, its origin still not uniquely determined. So it is assumed that the Lepchas are possibly emigrated from Tibet to Sikkim. The Lepchas today belong to the Tibetan Buddhist faith. Previously she exercised a shamanistic religion called Mun. This entry was posted in 10s, 20th Century, Asia, India, Traditional and tagged Tibetan folk costume on 10/9/14 by world4.